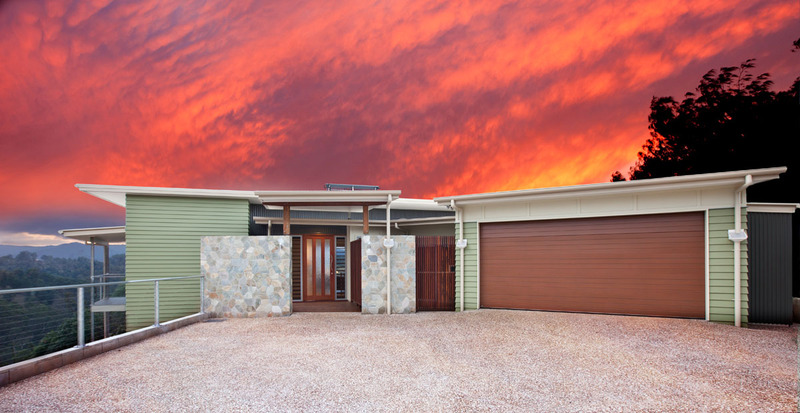 These dramatic and visually stunning houses, set in a private rural area were designed to suit the lifestyle of a young professional couple as well as the lifestyle of an older parent. 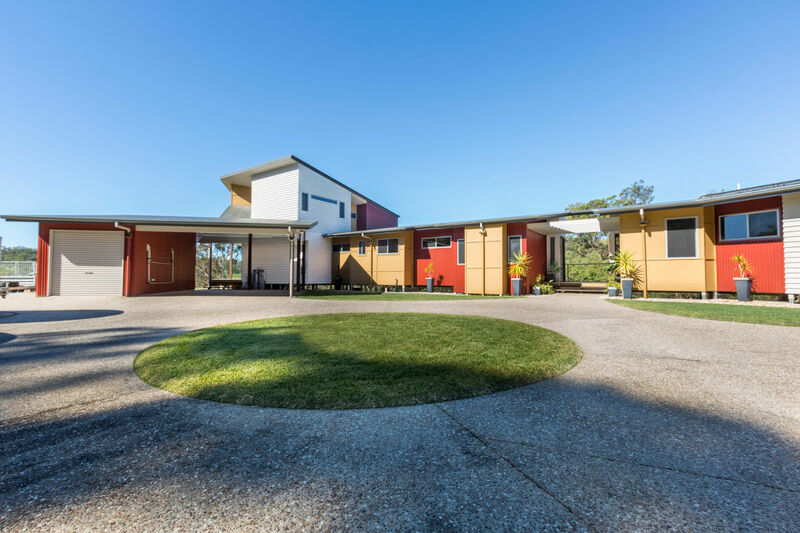 The primary goal was to ensure continuity by giving the appearance of one home but enable both to operate as separate spaces for maximum privacy and to provide future flexibility if required. The houses have separate phone lines, electricity meters, carports and entries but share the same roof line. The main house is set over 2 levels with the lower level comprising 2 bedrooms, a sunken media room and the living areas which flow through to the deck and swimming pool complete with a dramatic wet edge. 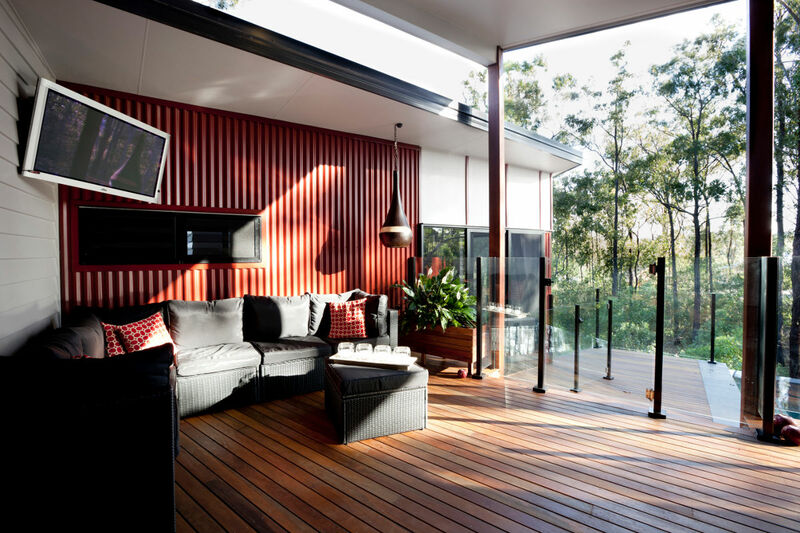 It was important that the pool be integrated with the living and entertaining deck but with a steep hillside to contend with it had to be built up over 4m in order to achieve this. 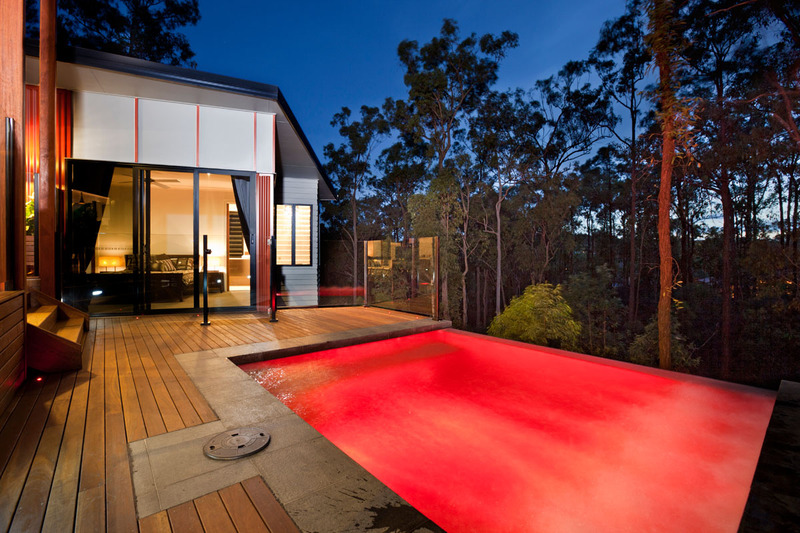 This allows the pool to be on the same level as the living area and deck to maximise usage. Cleverly, storage of pool equipment was incorporated into the design and is tucked away under the pool. The installed Viron P300 pool pump is the first in Australia to be approved by MEPS with an outstanding 8 star energy rating which will save up to $700 a year on energy costs. 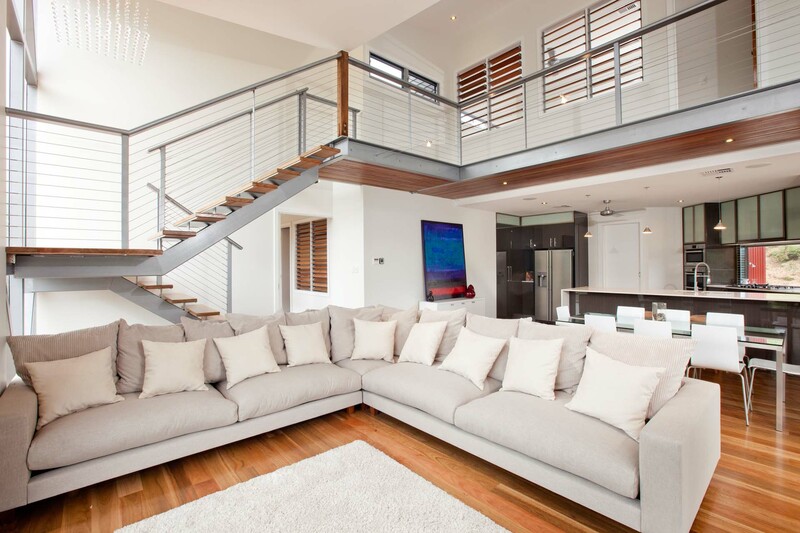 Soaring high above the living area is the void space dominated by striking mono stringer stairs finished with exposed metal, Stainless Steel wires and timber posts evoking an unexpectedly industrial feel; a deliberate contrast with the rural surrounds. Trapeze lighting has been strung across the void in recognition of the modern industrial theme. 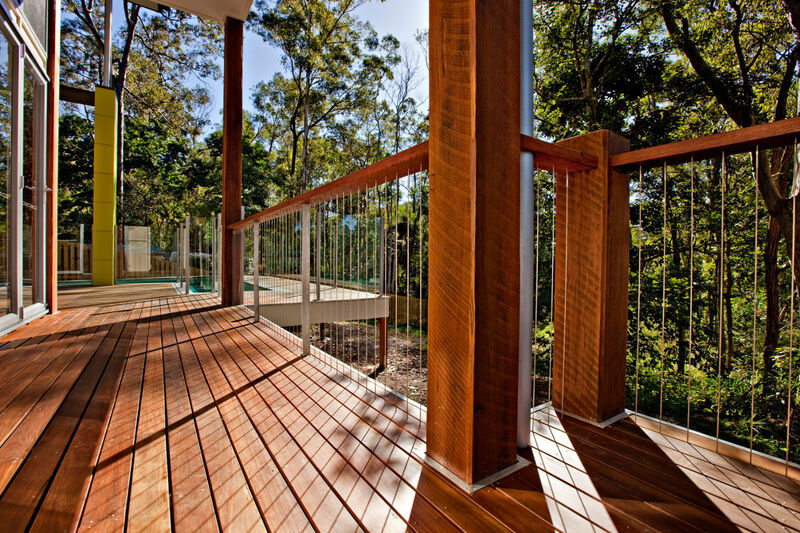 Framed by Spotted Gum treads and floor boards the upper walkway is designed to look like an internal timber deck to complement the external decks and link the beautiful timber features together which anchor the home to the rural setting. Underneath the walkway the timber decking is deliberately exposed to continue the industrial feel. 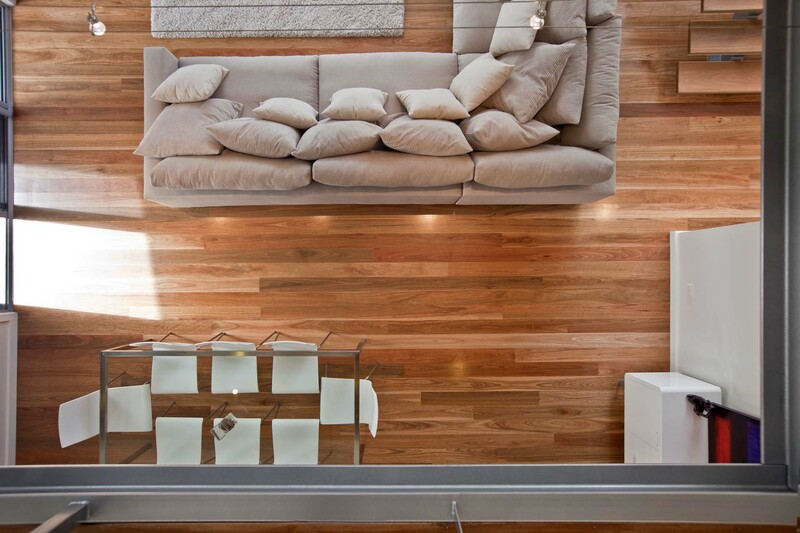 This is contrasted by high gloss kitchen cabinetry, frosted glass cupboards and a large white stone benchtop providing deliberate separation of spaces within the open plan living area. The Master Bedroom and Ensuite take up all of the upper level providing the owners with a private retreat complete with spa overlooking the valley below. The walkway is continued outside to provide the Master Bedroom with its own deck overlooking the pool. 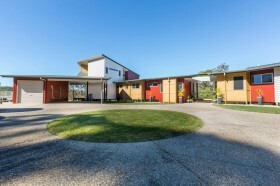 Each home enjoys a carport and external storage area and the main house also has an outside shower and toilet. 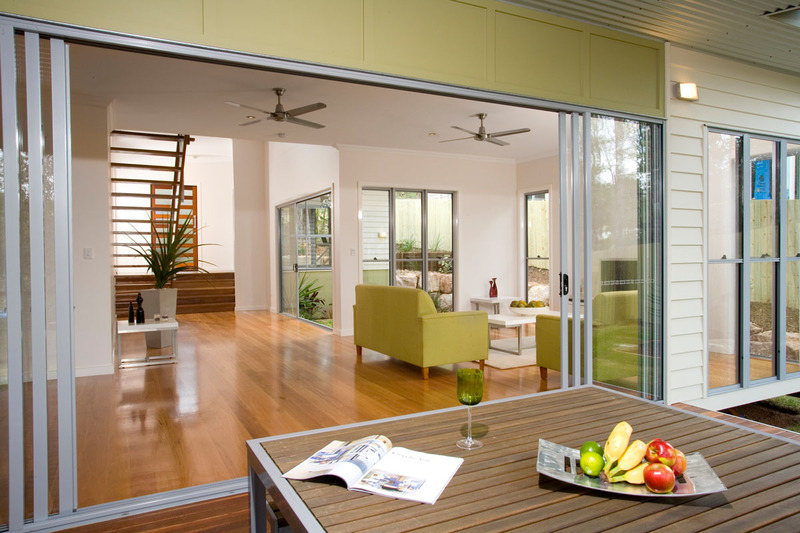 Each of the homes living areas are accessed via long hallways with large windows offering views across to the creek. Each bedroom has timber louvres facing the hallways to maximise breezes and light into the rooms. The smaller house is situated at the opposite end of the site and comprises 2 bedrooms, open plan kitchen living area, a study and deck. 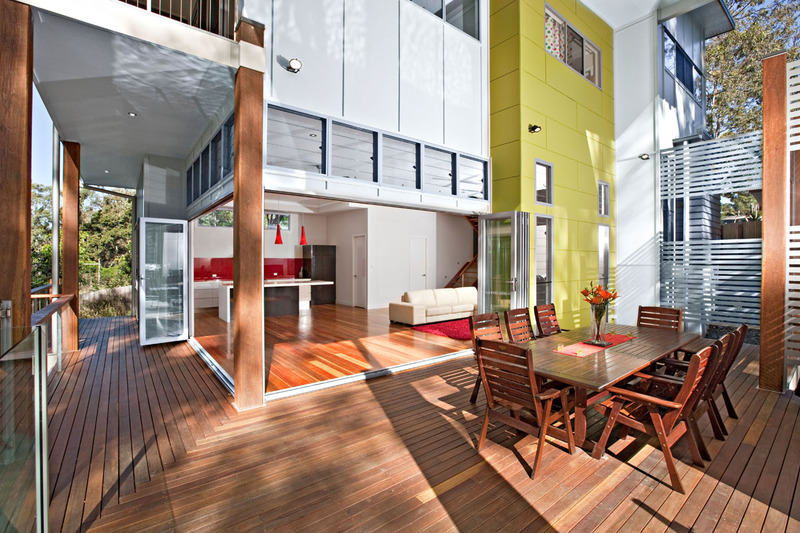 Integration with the main house has been ensured by the use of similar materials and colours. 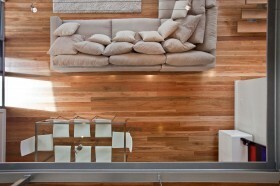 Internally Spotted Gum flooring is used extensively throughout and clean lines are achieved by the use of white walls and ceilings and Stainless Steel lighting choices. Externally the houses are completed in strong earthy colours to reflect the surrounding bush land and are finished with large timber posts and the strong lines of Hardies Linea and aluminum shades on each side. With no town water connection all water has to be collected and stored on site in 3 large zinc tanks. The round tanks deliberately contrast with the sharp angular lines of the homes and hold over 60,000 litres. Due to the close proximity to the creek flowing through the property Ecosafe was selected as the preferred effluent system. Ecosafe requires only 1 annual service and has the lowest operation cost due to only 1 mechanical component, the irrigation pump, which costs only $4-$5 per year to run. At the completion of the cycle Ecosafe provides clear, odourless recycled water which is dispersed along the site by automatic sprinklers. Solar power along with sensitive orientation, 8 star pool pump, ceiling fans throughout, floor, roof and wall insulation ensures year round comfort and excellent energy efficiency.